Police are appealing for information about a car seen leaving the scene of a fire in Aberdeen on Sunday. It has emerged that an industrial-sized wheelie bin was set on fire in the Charleston Park area of Cove at about 01:20 on Sunday. Several boats and a boathouse were destroyed in a suspicious blaze at Cove harbour at about 03:00 the same day. Police want to trace a red saloon-type car seen leaving the scene of the wheelie bin fire. Officers have been carrying out additional patrols in the area as well as at the site of the Aberdeen Harbour expansion in Greyhope Road where a crane was set alight and vandalism was carried out. Det Insp Allen Shaw said police were keeping an open mind as to whether the incidents were linked. He appealed for anyone with private CCTV or dashcam footage which may have captured the car, or anyone who saw any unusual activity on Sunday to contact police. Det Insp Shaw said: "We would like to thank the local community who continue to come forward and assist us with our inquiries. "In relation to the Charleston Park fire we have been told that a red saloon-type car was seen leaving the scene and I would urge anyone with information to call the police on 101. "As our inquiries continue into each incident I must stress that we are still keeping an open mind as to whether they are linked. Additional patrols have been carried out every night since to help prevent any similar incidents from occurring." 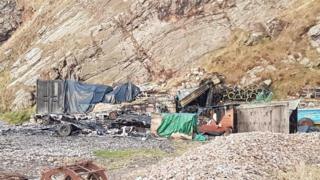 He added: "In the past week it has been extremely heartening to see so many people supporting the fishermen who lost their possessions in the fire at Cove harbour. "But this incident - along with the others - were malicious crimes and I would like to provide every assurance that extensive inquiries are ongoing to identify who is responsible for them."